If there is food that is most deserving to be crowned the monarch of your Noche Buena spread, it must be Crown Roast! 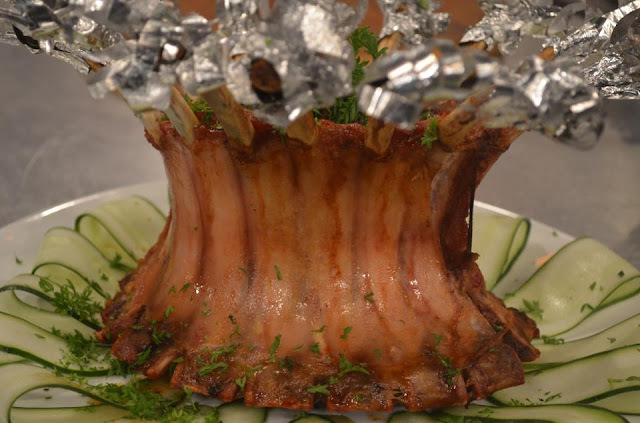 The rib bones sticking out like turrets on a king's headgear add another celebratory dimension to this already festive dish. If you want to say "Merry Christmas" with food, this is definitely it! 2. To Make Stuffing: Melt butter in a large skillet over medium heat. Add onion and saute, stirring frequently, for about 5 minutes. Stir in celery and apples; saute (without browning) about 5 minutes. 3. Scrape skillet contents into a large mixing bowl. Add bread crumbs, ground pork, sausage meat, parsley, sage, salt and pepper. Mix together gently but thoroughly. 4. Fill the center of the crown with the stuffing, mounding it slightly. Cover it with a round of aluminum foil and wrap the ends of the chop bones in strips of foil to prevent them from charring and snapping off. 6. Carefully transfer the crown to a large, heated, circular platter, strip the foil from the ends of the chops and replace it with paper frills. Let the crown rest for about 10 minutes before carving and serving.